KOKOMO, Ind. — Eight students in the Division of Allied Health made history at Indiana University Kokomo, as the first inductees into the newly formed chapter of Lambda Nu honor society, which rewards academic excellence in the radiologic and imaging sciences. 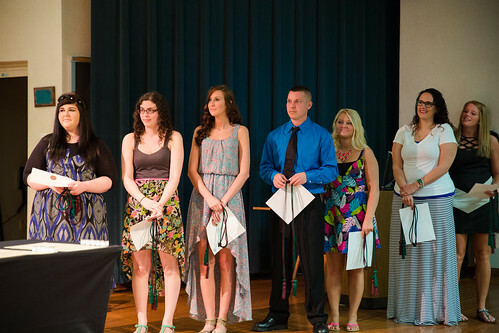 The School of Nursing and the School of Business also honored outstanding students with induction into honor societies. Heidi Sebastian, clinical assistant professor of radiographic sciences, said Lambda Nu's objectives are to foster academic scholarship at the highest levels, to promote research and investigation in the radiologic and imaging sciences, and to recognize exemplary scholarship. IU Kokomo's Gamma chapter is one of three in Indiana. "Lambda Nu not only provides academic recognition for our students' achievements, it gives them a new network of radiography and imaging sciences professionals outside of IU Kokomo," she said. "Our students consistently place in the top 20 percent on national certification exams, and earn outstanding grades, so we are pleased to have this outlet to honor their academic and professional achievements." To be considered for membership, students must have a minimum of a 3.30 grade-point average (GPA) and be a current member of the Indiana Society of Radiologic Technology and of the American Society of Radiologic Technology. Each one also must be an active member of the campus Medical Imaging Club. Associate of Science in Radiography students inducted into Lambda Nu included David Brinkley, Corenn Duke, Carly Moore, Courtney Perez and Whitley Wilson, all of Kokomo. Bachelor of Science in Medical Imaging Technology students inducted were Kenzie Daniel and Jennifer Dessing, Kokomo; and Stephanie Parton, Sharpsville. The School of Nursing inducted 16 students into the Alpha chapter of Sigma Theta Tau International Honor Society of Nursing. "This is a wonderful accomplishment," said Dean Linda Wallace. "This honorary was founded by IU students in 1922, so these new members are part of a long tradition of advancing world health, and celebrating nursing excellence in scholarship, leadership, and service." New members include Whitney Orr, Cicero; Mellanee Neely, Converse; Kaitlin Townsend, Forest; Leslie Phillips, Frankfort; Daphney Ingle and Lisa Millspaugh, Greentown; Andrea Wehr, Huntington, Lindsey Abell, Cari Cochran, Jessica May, Susanne Miller, Cameron Morris, Jillian Redmond, and Brittany Stallsworth, Kokomo; Alyssa Bohuk, Tipton; and Karin Hollenback, Wabash. The School of Business inducted 12 new members into Beta Gamma Sigma honorary. Undergraduates must be in the top 10 percent of their class to be inducted, while graduate students must be in the top 20 percent. David Rink, professor of marketing, said the organization's mission is to promote high standards for business leaders, and to reward academic achievement. Graduate students inducted were Stephanie Fantuzzo, Tia McKay, and Aaron True, Kokomo; and Christopher Lammer, Noblesville. Both True and Lammer also were inducted as undergraduate students. Undergraduate inductees were Kyle McAninch, Burnettsville; Carol Raines, Cicero; Kristie Stanley, Fairmount; Caili Thomas, Kempton; Brittany Smith, Lafayette; Joshua Weaver, Noblesville Garrett Meives, Peru; and Ashley Miller, Sharpsville.